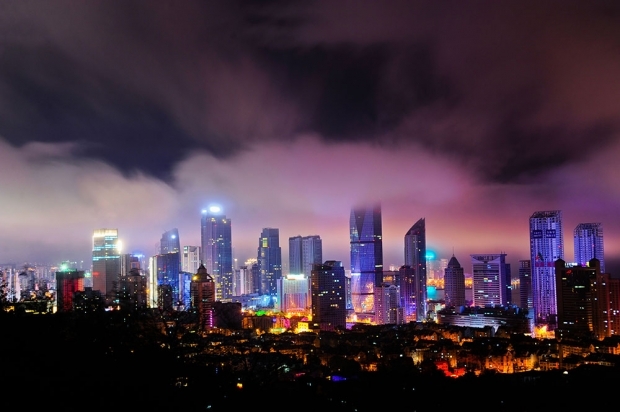 A foggy night in Qingdao, Shandong province, April 29, 2015. China is the world’s largest energy consumer, and its energy use is dirty and inefficient. But it is working hard to change that. Currently, coal accounts for nearly 70 percent of China’s total energy consumption, and this, coupled with an aging manufacturing infrastructure, a growing fleet of cars on the roads, and inefficiently insulated buildings, is the main reason why China alone produces almost 30 percent of world CO2 emissions. (The U.S., by contrast, produces around 16 percent.) Coal burning also causes much of the country’s PM2.5 air pollution—the tiny lethal particles that penetrate human lungs and can enter the bloodstream, that were the subject of the recent wildly popular online documentary “Under the Dome,” which was viewed by some 200 million internet viewers before the government shut it down. China’s leaders are well aware of this dirty truth and are striving to shift toward renewable energy and away from an over-reliance on coal. Eyes will be on China as energy-related components of the 13th Five-Year-Plan are expected to be released later this year, and in December, in Paris, the United Nations Framework Convention on Climate Change will bring together the world’s largest greenhouse gas emitter nations in an attempt to negotiate a legally binding agreement to reduce emissions. In Paris, China has the potential to be a global leader because of the steps it has taken to reduce emissions and shift its energy mix toward renewables. On November 11, 2014, the momentous U.S.-China Joint Announcement on Climate Change and Clean Energy Cooperation was released. In it, President Xi Jinping set a national goal for peak CO2 emissions around 2030, and for 20 percent (up from its current 10 percent) of the country’s energy to come from renewables by the same year. The press release notes the amount of new “nuclear, wind, solar and other zero emission generation capacity” China will add by 2030 is massive, comprising “more than all the coal-fired power plants that exist in China today and close to total current electricity generation capacity in the United States,” amounting to an additional 800-1,000 gigawatts zero emission generation capacity. Can China meet its energy goals? Many experts are optimistic it will not only meet them but meet them faster than promised in the Joint Agreement. In “Carbon Emissions in China: How Far Can New Efforts Bend the Curve?” scientists from Tsinghua University and MIT show that China’s CO2 emissions could level off as early as 2025 (five years ahead of the goals laid out in the Joint Agreement) with no adverse effect on economic growth. And preliminary data from the International Energy Agency (IEA) show that global energy-related emissions of carbon dioxide did not grow in 2014. The IEA credited China’s switch to consuming more electricity from renewables and less from coal as one of the major drivers of this leveling off of CO2 worldwide. 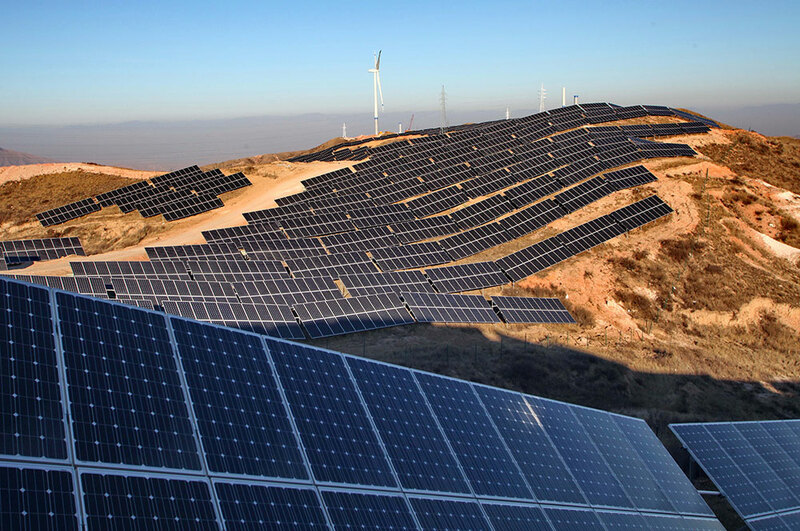 China’s renewables strategy has received significant thought and attention from world experts, including the influential American energy innovator Amory Lovins of the Rocky Mountain Institute (RMI). Drawing on the insights from his book Reinventing Fire, which shows how the U.S. could profitably transition off of fossil fuels by 2050, Lovins co-founded the Reinventing Fire: China project, a pan-pacific partnership between Energy Research Institute (ERI, the energy think tank of China’s National Development and Reform Commission); China Energy Group at Lawrence Berkeley National Laboratory (LBNL); Energy Foundation’s China Sustainable Energy Group; and Rocky Mountain Institute. The principal goals of the project are to chart a cost-effective clean energy roadmap for China, and to contribute transformative policy recommendations to the upcoming 13th Five-Year Plan. RMI has put out a white paper on its work on China; the full report will be released in the summer of 2015. Another point in China’s favor is the little-publicized fact that the country is already a leader in renewables. China has more hydropower and wind electrical generating capacity than any other country and will soon replace Germany as a world leader in solar. In 2014, worldwide investment in clean energy rose 16 percent to $310 billion by Bloomberg New Energy Finance’s tally; of that, China’s share was $89.5 billion, almost 30 percent of the world’s total. Flood water is discharged from the Three Gorges Dam on the Yangtze River, in Yichang, Hubei province, July 24, 2013. China is home to many of the world’s great rivers, and hydropower is by far China’s largest source of renewable energy. Nearly 20 percent of its electricity is from the country’s 300 gigawatts of hydropower capacity. 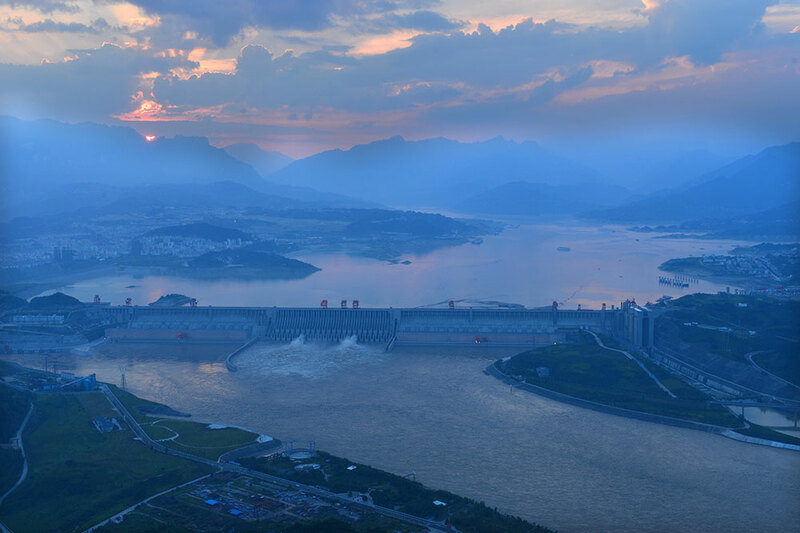 The recent additions of the Xiluodu and Xiangjiaba hydropower projects complete a cascade of dams in the Jinsha River valley. Those dams are now among the largest in the world after the Three Gorges Dam (which cost $50 billion dollars and generates enough electricity to power Pakistan or Switzerland). Total hydropower capacity is targeted to rise to 350 gigawatts by 2020. The question of further expansion of hydro capacity will be tricky for several reasons. Aside from potentially displacing existing inhabitants (some 1.3 million people were forcibly relocated during the building of the Three Gorges Dam which is so large that it slightly affected the earth’s rotation when it was flooded), dams damage river ecosystems and are often built on fault lines which can increase the risk of earthquakes. Dam building frequently involves the controversial re-routing or diverting of water from rivers that flow across international boundaries. A series of dams along the 2,700-mile Mekong River, which flows from the Tibetan Plateau to the South China Sea, has created as yet unresolved tensions with downstream neighbors Myanmar, Thailand, Laos, Cambodia, and Vietnam. China’s planned expansion along the Tibetan plateau, on the Yarlung Tsangpo river near the “Great Bend”—where the river plummets into some of the deepest gorges in the world as it makes a sharp southward turn to enter India—is a sort of hydro Holy Grail for China, which has in the past talked of plans for a dam three times the size of the Three Gorges Dam. But this is politically difficult because the Yarlung becomes the Brahmaputra and Jamuna, rivers which flow into India and Bangladesh, and there is no formal water-sharing agreement among these nations and China. China also recently dialed back plans for a dam in Chongqing, though for environmental reasons. The order came from the Ministry of Environmental Protection and potentially signals an end to what would have been Chongqing’s largest infrastructure project. Flooding the dam’s reservoir would have threatened a protected area of river that has been a haven for a wide variety of fish (some of which are endangered species) that was set aside by the government earlier, in order to offset some of the negative downstream impact of the Three Gorges Dam on the ecosystem. For Chinese hydropower, much of the easy benefits have been reaped. Going forward, China will increasingly face both the potential negative environmental consequences of its actions and the equally pressing need for water agreements so that it can fairly share the water of international rivers with its downstream neighbors. 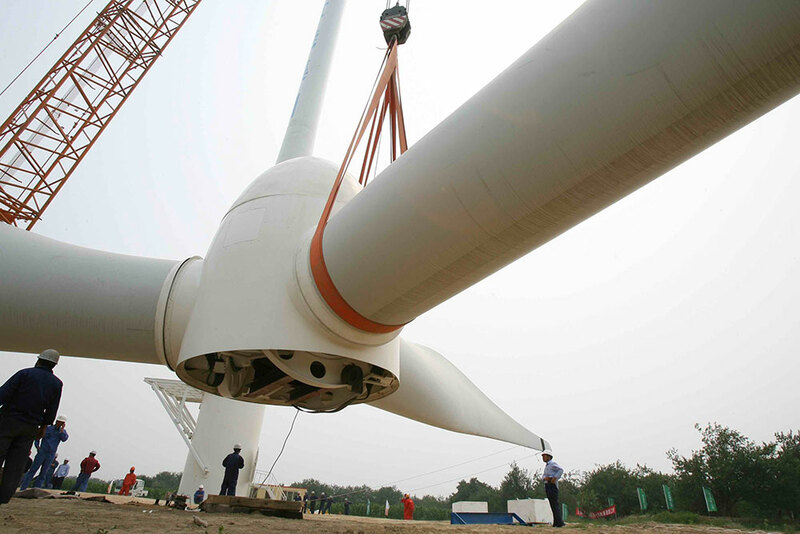 Wind turbines are installed at the Beijing Guanting Wind Power Plant in 2007. The city’s first wind power plant, it opened with 33 turbines. Wind is China’s number two renewable energy source after hydropower, and with 114 gigawatts of installed wind power, China is home to about one-third of all the wind power capacity worldwide. The country plans to add wind prodigiously, and plans to have 200 gigawatts of wind by 2020, an amount equal to more than half the world’s current wind capacity. But this is not the success story the numbers would at first lead one to believe. Top-down central planning often leads to inefficiency, and even though China’s wind capacity is about 1.5 times that of the U.S., it produces roughly 20 percent less electricity from its wind-power base than does the U.S. The underwhelming reality is that grid-connected wind power in China, according to the Chinese NEA, could generate seven percent of China’s electricity, but in 2014 it produced 2.8 percent. Partly this output differential is because wind, like solar, is an intermittent power source, so it will never produce at full capacity (in sharp contrast to something like nuclear, which provides a constant and stable output of power). But partly it is due to the phenomenon known as “curtailment,” a situation in which grid operators do not take up the electricity produced by wind. The reasons for curtailment are partly political. When the grid buys wind power, the government has been slow to pay it an incentive known as a feed-in tariff, and the grid infrastructure can be overwhelmed by spikes of wind power produced in periods of strong winds, so the grid owners have tended to favor coal-fired power. At around 10 percent, curtailment is improving, but still means that wind operators are losing 10 percent of their potential revenue. In addition, grid-connection delays, poorly located wind farms, and cash shortages as a result of a national credit squeeze have all hampered China’s wind market. China has made a bold start on becoming a wind giant, but it must sort out bureaucratic tangles, like the timely payment of the feed-in tariff, and continue to make significant investments in its power grid if it wants to maximize its wind potential. A power plant in Zhangjiakou, Hebei province. As a market for solar, China is among the fastest-growing and the largest. At 28 gigawatts of installed solar in 2014, China was second only to Germany’s 38 gigawatts. And it intends to grow solar to 100 gigawatts of installed base by 2020, a figure which implies that, to meet its goal, each year between now and the end of 2020 China will add new solar capacity that is roughly equal to the entire 2013 U.S. solar installed base. Since 2010, solar energy has seen the largest share of worldwide investment in renewables each year driven by the fact that in many regions, solar is now cost-competitive with coal-fired power. Chinese companies dominate solar manufacturing, and they were responsible for the massive expansion of photovoltaic (PV) solar manufacturing capacity over the last decade. In 2005, Suntech, a Chinese solar manufacturer, went public, and by 2007 its stock had increased in value almost six-fold. Shi Zhengrong, its founder, was at one point one of China’s richest men. Attracted by his success, many companies sprang up. Aided by generous government support for solar expansion, including cheap loans from state-run banks and subsidized land, tax breaks, and other support from local regional governments, China’s solar sector became a leader in the industry and by 2013 Chinese companies held seven out of the top 10 slots in the industry. As a flood of new capacity came online, solar pricing fell dramatically. And as prices plummeted, solar installation skyrocketed: from 2005 to 2013, the global solar power installed base grew 25 fold, largely thanks to China’s making solar energy equipment more affordable. According to Mark Clifford in The Greening of Asia: The Business Case for Solving Asia’s Environmental Emergency (a book to which I contributed research), solar’s price is only about one percent of what it was in the 1970s, with most of the drop occurring in the past decade as a result of Chinese competition. This drop in the price of solar has been a boon for the world, and has greatly helped solar energy to be competitive with fossil fuels on an un-subsidized basis. It is also a win for China, as it now is the biggest buyer of solar panels and Chinese companies remain leaders in manufacturing. Construction of the No. 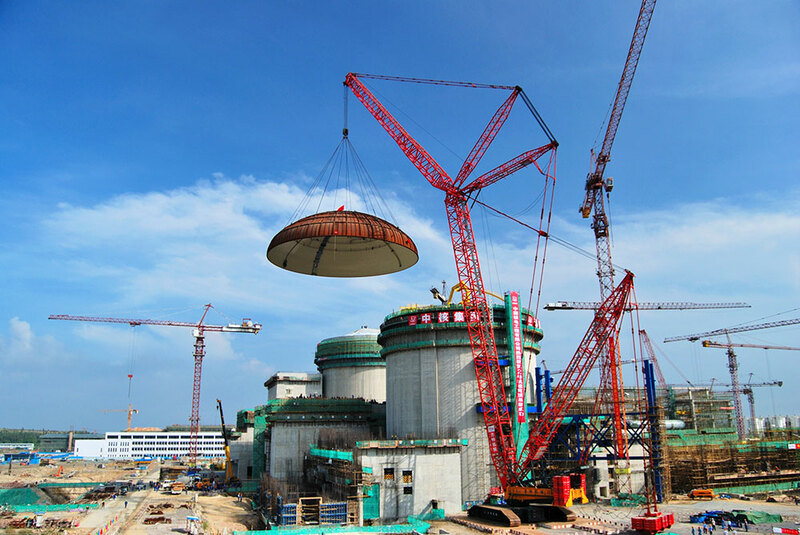 2 reactor of the Changjiang Nuclear Power Plant on September 25, 2012 in Changjiang county, Hainan province. China has very ambitious plans for nuclear power. Nuclear can generate large amounts of low cost electricity reliably, without the surges of an intermittent source like solar or wind. At around 20 gigawatts, nuclear’s share of China’s electricity generating capacity is small but it has much room to grow—and China plans to grow aggressively. The number of reactors under construction worldwide is currently around 71 units and of those, 28 are in China, accounting for about 40 percent of all new nuclear capacity. China’s plan is that by 2020, its nuclear generating capacity will have risen from its current 19.88GW to 58GW, with another 30GW under construction, targets that have been revised downward after the Fukushima Daiichi accident. To help fund this capital-intensive effort, China’s largest nuclear facility operator, CGN Power Co. Ltd., raised U.S.$3.2 billion in an initial public offering on the Hong Kong exchange in December 2014. China’s shift to renewable sources of energy will take time. But it is abundantly clear from their actions that China’s leaders have moved beyond the old “get dirty, get rich, get clean” approach largely taken by the West, to one that more realistically addresses the desires of Chinese citizens for clean air and a healthy environment for themselves and future generations. China’s goals are admirable, but in order to achieve them the country will require a great deal of political will as well as the recognition of its position on the world stage.